As the legislative session speeds on toward April 23, the 100th day of the session and the nominal end date for the legislature to complete its work, lawmakers are preparing to turn their attention to the budget. As always, there will be a fight about K-12 spending, and teacher pay, in particular. And there should be, given new data that shows just how pitifully Arizona stacks up, both nationally and globally. A new teacher salary report from the National Education Association shows teacher salaries nationwide have not kept up with inflation during the past decade. Although the nominal average teacher salary in the U.S. has increased by more than 11 percent since 2009, inflation-adjusted salaries were 4.5 percent lower in 2018 than they were in 2009. 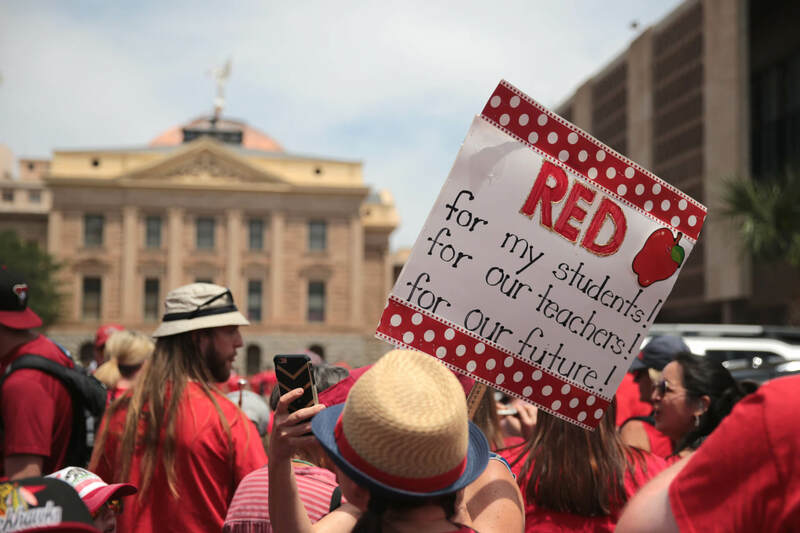 Arizona teachers have taken an effective pay cut of more than twice that. Since 2009, inflation-adjusted salaries here were 9.8 percent worse in 2018. In a news release announcing the report, Arizona Education Association President Joe Thomas said low salaries are a major factor in why Arizona has 1,700 vacant teacher positions. The effects of that teacher shortage can be most easily seen in the number of teachers the state employs per student. According to data from the federal government’s National Center for Education Statistics, Arizona had the worst student-to-teacher ratio in the nation in the 2016-17 school year, at 23.29 students for every teacher in the K-12 system. Even worse, the state is trending in the wrong direction. Arizona’s student-to-teacher ratio has gotten incrementally worse every year since 2011-12, when it was a mere 21.27 (and third worst in the nation). Of the five worst states in 2011-12, Arizona is the only state to have a worse student-to-teacher ratio five years later, and the only state to see that ratio increase by 2.02 students. By contrast, fourth-worst Oregon cut its ratio by 1.75 students per teacher by 2016-17, the largest decrease in the nation during that time. Arizona’s bad standing on students per teacher doesn’t end at our borders, however. Data recently published by UNESCO shows the student-to-teacher ratio for nearly every country in the world. The worldwide average was 23.6 for elementary school and 17.1 for high school. Arizona has more students per teacher than Nepal (20.9), Kazakhstan (20.8), Rwanda (20.1) and Lebanon (12.5), according to UNESCO’s data. UNESCO also grouped countries together by similarity, to allow broader comparisons. Arizona’s students are in a worse situation than their peers in low-income countries (21.73), sub-Saharan Africa (21.71) and Arab states (20.22). And yet, Republicans are ready to declare victory. Last year’s plan to increase teacher pay shouldn’t be viewed as a solution, but as a starting point. Otherwise, Arizona’s bragging rights over Kyrgyzstan, which has 24.9 students per teacher, won’t last. Teachers and nurses treated like second hand citizens in AZ .